Hermes is known around the world for their luxury leather products such as handbags, purses, wallets and belts, their fragrances and their luxury silk scarves. Because of this, most people don’t associate the brand with their luxury watch collections, but they should. Today we’ll be reviewing one of their larger and more popular collections; the Hemes Cape Cod. One of the features of the Cape Cod which is most certainly worth mentioning is the case shape. Aside from the rounded rectangle shaped case, that is. While this is the single most distinguishable feature in the design, there is a more practical shape to the case when glancing at the profile of the watch. The case back has a curvature that conforms to your wrist allowing for very comfortable wear. Another noticeable signature feature of the Cape Cod watches from Hermes is the font used on the dials. It’s not your typical font and the rounded edge Arabic numeral style is a perfect match to the rounded rectangular case shape. The watch depicted just above in this article is the Hermes Cape Cod TG, a medium sized ladies’ quartz model at a 29mm x 29mm case size. It uses a Double Tour strap which wraps around the wrist twice and is crafted to perfection, the kind of quality you can expect from a brand like Hermes. While most of the watches in the Cape Cod collection are sized for a ladies’ wrist there are several men’s watches in this collection as well. A good example is the Cape Cod Automatic Large TGM which uses the Hermes manufacture H1912 automatic movement. This is the only size that has an Automatic movement. All other sizes are powered by a quartz movement. A distinguishable feature of the mechanical Hermes Cape Code watches is the guilloche textured dials. This is a raised waffle pattern stamped in the center of the dial which looks like a miniaturized version of the tapisserie dials found on the Audemars Piguet Royal Oak and Royal Oak Offshore watches. The TGM stands for très grand modèle which is French for "very large model". This large Hermes Cape Cod Automatic has a case size of 36.5mm x 35.4mm. While a watch with a round case shape would be considered rather small at this size it wears larger on the wrist because of the shape of the case. The mid-sized Cape Cod watch is called the Cape Cod GM which starts for grande modèle which means large model in French. This one has a case size of 29mm x 29mm. The small Hermes Cape Cod watches are 23mm x 23mm and are called the Cape Cod PM which is for petite modèle, or small model. These double wraparound watch straps became a growing trend with Hermes, and they can be found in several collections such as the Hermes Kelly watch collection, the H Hour collection the Cape Cod Tonneau watch series and of course, the Cape Cod watch collection that we’re reviewing here. Hermès has already proven that they are capable of producing in-house movements. Some great examples would be the Hermès caliber H1912 which can be found in the Hermes Carré H series and the Hermes H1925 caliber found in the Hermes Arceau Squelette Automatic TGM series. The dials in the Hermes Cape Cod Collection vary depending on the subseries. While the automatic model depicted above features a square-shaped textured guilloche dial located in the center with the printed second's track displayed in an inner chapter ring, this is rare as most watches in this collection have a smooth and clean dial color. Some of the higher end ladies’ models have a lovely mother of pearl dial and many models feature diamond hour markers and diamond paved cases. In terms of straps and watch bands, the Cape Cod collection offers many types of straps using several different materials such as calfskin leather to alligator leather and even a few models with stainless steel mesh bracelets. Time and time again Hermes demonstrated their ability to design and produce some inventive and very stylish watches and possibly with the best leather straps you can get. 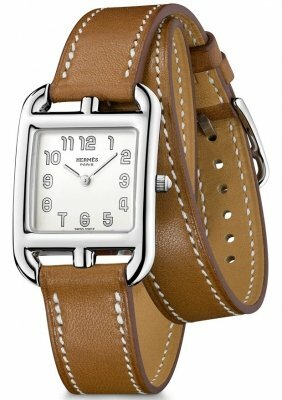 A replacement “Double Tour” Hermes watch strap, like the one depicted on this watch, would cost about $450. As with many of Hermes’ leather products, the watches that are fitted with their leather straps often have tasteful vibrant colors such as royal blue, magenta, teal, violet, orange, yellow and a soft pale pink, while many other watches have more conservative hues on their straps such as black and brown and even a dark blue. In summary, this is a very special collection of watches with something for just about anyone. Click below to browse the entire collection.